This blog has posts that interests all the youth around the world wherein, Youth is the time to go flashing from one end of the world to the otherâ€¦ to try the manners of different nations; to see the sunrise in town and country; to circumnavigate the metaphysics, write halting verses, run a mile to see a fire, and wait all day long in the theater to applaud the beauty of feminine........so keep it up n ejoy the posts!! This what your YOUNGISTAN Blog Ad will look like to visitors! Of course you will want to use keywords and ad targeting to get the most out of your ad campaign! So purchase an ad space today before there all gone! 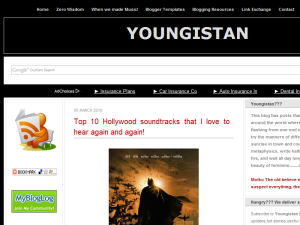 Top 10 Hollywood soundtracks that I love to hear again and again! I found this very interesting comparison of heavenly bodies on stumbleupon at rense.com. I thought it would be a nice share. Can we stop aging and reverse it's effects? Five First Person Shooter games that I love the most! If you are the owner of YOUNGISTAN, or someone who enjoys this blog why not upgrade it to a Featured Listing or Permanent Listing?